Lately I have been doing a lot of work trying to minimize the bump steer in the 91 rear suspension. What I discovered is that there are three things that will help in that regard. One is to raise the rear tie rods a little where they attach to the knuckle (or lowering the ball joint would be an option as well). The second is to shorten the tie rod a little, and the third is to move the tie rod back (toward the rear of the car) at the knuckle end. By rotating the tie rod bracket in you raise the pivot and shorten the tie rod. As you can see the, the tie rod is basically at its minimum length in this configuration. I also stacked a couple of washers between the tie rod and the bracket to move the pivot back a little. The end result is that bump steer is reduced from about .080" per inch of travel to about .015" per inch of travel. The toe change is still in the same direction as a stock 91 (in on compression, out on rebound), just greatly reduced. My experience with this is that it significantly improves stability and makes the car much easier to drive fast. Future versions of my kit will have index marks on the brackets to make it easy to set them to either the vertical position or the angled position. But, for those who already have the kit and want to do this, it's pretty straight forward. The rotation is about 32° if you prefer to measure it as an angle, but it is probably easiest to create a match mark on the knuckle and bracket when the bracket is vertical, and then rotate it until the marks are .510" apart. Last edited by Alex W; November 9th, 2018 at 09:23. Can this work on a 93, or even needed at all? Unfortunately this doesn't have the desired effect on the 93, at least not according to my model (I have not measured actual bumpsteer on the car on a 93 like I have on my 91). The tie rods on the 93 are just so long that you are pretty much stuck with what they give you, which is lots of toe in on both compression and rebound. "lots of toe in on both compression and rebound" I thought that would be a good thing, well not excessively of course, other than scrubbing speed. Can't rotate it the other way either? Not sure how it affects geometry ,I flunked that subject back in high school, lol! Man and i JUST got my alignment done. Thanks for the further updates Alex, i'll incorporate this adjustment when i get it realigned in a month or so, lol. Whats the overall thickness of the washers you stacked between the bracket and the toe adjustment rod? 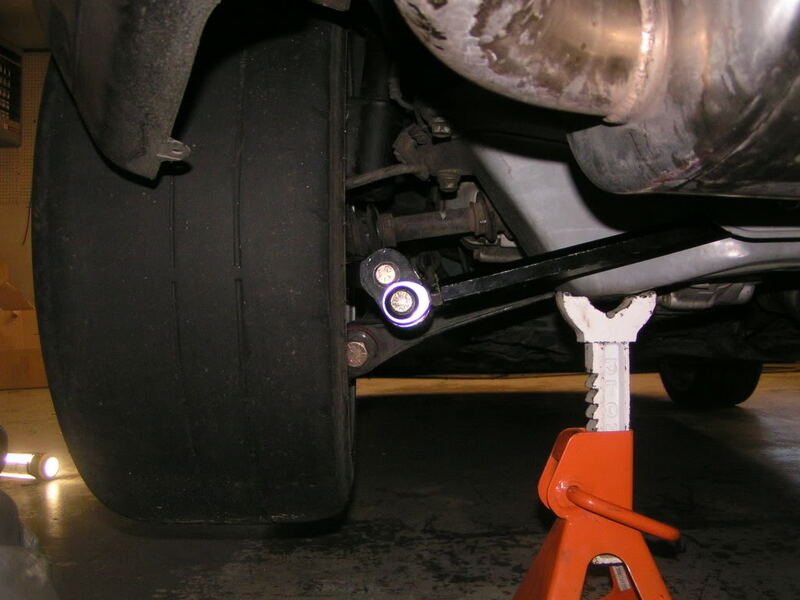 how much should the rear tie rod be spaced back? One to two washers worth, IE, about .1 to .2". It's not really critical. The majority of the improvement comes from pivoting the brackets, but a washer or two helps a little as well. I wouldn't go more than 2 washers worth however. I was considering the same adjustment to clear my rear wheels, as I run a 17x9.5 50os. Interesting that it may turn out to be beneficial. Bumping this back up. For those that are running this kit what are you running for rear toe? I set the brackets angled in when I did the install a while ago but I set my rear toe to factory spec. Couple that with the amt of camber I'm having to run to clear the 255 tire on a 9.5+20 and tire wear is not my friend. Looking to realign soon and significantly reduce toe. Will also stack a couple washers when I start adjusting. I didn't want to post here until I had a running MKII (it's been almost two years), and I couldn't quite remember my exact alignment settings from before. But, I ran my first autocross in the new car on Saturday. Rear toe was about half of the stock 91 spec, or about .1" total toe in. A bit of easily controllable lift-off oversteer, but overall, nothing dramatic. Might be able to get away with even less, but .1" total (.12° per side) seems like a good starting point. Thank you for the update. I'm genuinely interested to see if you can accomplish the same thing, while retaining the clearance required to run 15s. The 2012 mock-up with the angled brackets looks exactly like what I need to do just that. Any plans to develop that style? All kits produced in the last few years have a pair of alignment "bumps" on the top of the brackets. One straight up for the "traditional" 91 geometry, or for use with a 93+ car, the other for installing the brackets at an angle like this. Older kits can be installed like this as well, but you have to do a little more work to figure out the angle. However, clearing 15's is going to be an issue on the ball joint more than anything. 16s are really tight, I think a smaller RCA would be required for 15s. Is there any updates on when the new version will be coming out. At the moment I have about 10 kits in stock. I might do group buys in the future on new products, but things like this I am trying to keep in stock at this point, rather than doing group buys.